Courtesy CSCS; J. Favre, A. Sheyko. Earth's magnetic field has reversed direction hundreds of times in the course of our planet's history. Simulations on the Piz Daint supercomputer may have explained why. Four million CPU hours of simulations on the Piz Daint supercomputer at the Swiss National Supercomputing Center (CSCS) offer fresh clues on magnetic field reversal and point to a possible role of a phenomenon called dynamo waves. Magnetic appeal. The Earth's outer core surrounded by magnetic field lines during the modeled geomagnetic reversal. Courtesy CSCS. In November 2013 the European Space Agency (ESA) sent three satellites into space, which have since been making precise measurements of Earth's magnetic field. The causal mechanism for magnetic field reversals remains unclear to this day. One possible mechanism has now been identified by scientists Andrew Jackson and Andrey Sheyko at the Swiss Federal Institute of Technology in Zurich (ETH) and Chris Finlay of the Technical University of Denmark (DTU), based on simulations performed on the Piz Daint supercomputer. Their results were recently published in Nature. Simulations, seismic measurements, and the physical properties of minerals have so far been the only avenues for researching the emergence of our planet's magnetic field. Two material properties are key to the magnetic field and its reversal: One of these is the viscosity of Earth's core, which determines how rapidly the core convection currents come to rest. The other is electrical conductivity, which determines the magnetic field's rate of decay. In previous simulations, both these factors took place at the same tempo. "In our simulation, we let the magnetic field decay twenty times faster than the convection currents in the molten core," says Jackson. In this way, the scientists reduced the value of the coefficient setting the ratio between the two material properties, and approached Earth-like conditions more closely than in earlier simulations. The actual simulation goal was to investigate the stability of the magnetic field. A field reversal occurred after a certain time, followed by others at periodic intervals, reports Jackson. The only explanation for the observed field reversal was the influence of so-called dynamo waves. Dynamo waves are powerful global disturbances of the magnetic field emanating from the core. Their existence was postulated in 1955 as an explanation for periodic field reversals in the sun that take place every eleven years. Although significant differences between Earth's and the sun's magnetic field exist, the latest research results indicate dynamo waves play a role in magnetic field reversals within our planet as well. Simulation of highly complex processes in three dimensions requires extremely powerful supercomputers, and even these can only perform approximate calculations of Earth-like conditions. The research team took as the basis of their simulation a model developed in 2009 that assumed low viscosity while adding in heat flux at the surface of Earth's core. 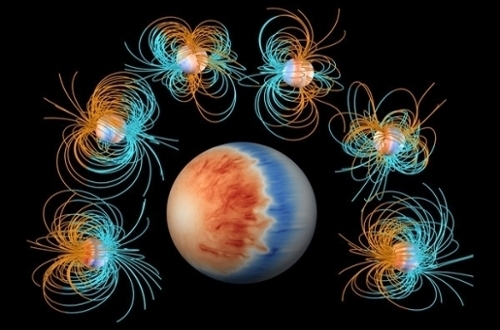 This was the first time a sufficiently strong and stable magnetic field under Earth-like conditions could be simulated. 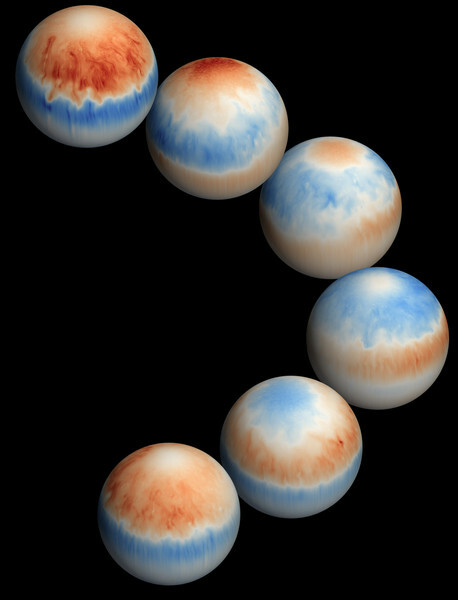 The researchers now supplemented this model with idealized conditions, assuming for simulation purposes the Earth-like planet was spherical, for example. At the same time they came closer to Earth-like conditions by letting the magnetic field and the current in the molten core decay at different rates. Using four million CPU hours on Piz Daint, the researchers were able to simulate magnetic field dispersion and the time taken to reverse polarity for a planetary dynamo with lower viscosity and higher rotational speed than had ever been accomplished before. In the simulation, a strong dipole magnetic field developed and periodically reversed itself every few thousand years. But in reality, Earth's magnetic field has reversed several hundred times at more or less irregular intervals – every 500,000 years or so in recent epochs. There is a marked difference from the simulated dipole field inasmuch as the Earth's field neither reverses with such consistent periodicity, nor exhibits the same combination of symmetries. "The physics underlying the simulation do in fact correspond to those of the Earth," says Jackson. But since the simulation still differs by orders of magnitude from real conditions on and inside the planet, for now the model provides only an indication that dynamo waves might play a role in magnetic field reversals. ﻿Read the original CSCS article here.